Charmed as I was by the fairy tale aspects of the movie based on C.S. 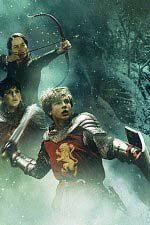 Lewis' first book in The Chronicles of Narnia, I found myself a bit flabbergasted by the grand battle scenes at the climax, which reminded me very much of the big battles in the Lord of the Rings movie trilogy. I only knew the Narnia books by their reputation, but never did I associate that reputation with mythological creatures meeting on the battlefield like some sort of supernatural Braveheart. My confusion at last drew me to pull out that used paperback of The Lion, The Witch and the Wardrobe I bought a decade or so ago. Not very long afterward - it's a short book! - I had my answer. Just as I suspected, the huge final battle, which the movie spends so much time and emotion on, comprises slightly less than two pages of a 186-page novel with big print and wide margins. Lewis' emphasis is on the gentler, fairy tale aspects of the story - the talking animals, the mean witch who turns her adversaries into statues, the great lion Aslan whose presence counters eternal winter, the return of Father Christmas. In most other ways the movie is remarkably faithful to the novel. Why raise the violence in a mostly gentle book to such prominence? Was this simply Hollywood playing to the lowest common denominator? That may be the case, but it also could be that glorifying war as a solution is a theme someone wants to emphasize among us masses. On the other hand, it's hard to completely dislike any movie that encourages resistance against an oppressive regime that snoops into every aspect of life but masks its evil nature by feeding candy to children. P.S. And how about National Treasure? A fun little action thriller that appears to be a trifle but manages to sneak in a line about how the most important passage in the Declaration of Independence is "whenever any form of government becomes destructive of those ends, it is the right of the people to alter or abolish it." Gotta love it! I didn't care for that much either, but I suppose that's just another example of "hollywooding" -- changing emphases to try to make the story more marketable. "These two Kings and two Queens governed Narnia well, and long and happy was their reign. At first much of their time was spent in seeking out the remnants of the White Witch's army and destroying them .... But in the end all that foul brood was stamped out. And they made good laws and kept the peace and saved good trees from being unnecessarily cut down, and liberated young dwarfs and young satyrs from being sent to school, and generally stopped busybodies and interferers and encouraged ordinary people who wanted to live and let live." I find very little to find fault with in that. It's certainly a far sight better than what we're living under. Rockwell on immigration policy "reform"